Delicious Instant Pot Hawaiian Pineapple Pork is a tasty Hawaiian/Asian fusion recipe that you can serve over rice. 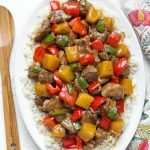 The chunks of pork are very tender and the sauce has a lot of flavor with pineapple, red bell peppers, and yummy seasonings. Gather everything together and get it all chopped and measured. Drain the pineapple chunks, and reserve the juice from the can. Mix together the sauce: 3/4 cup pineapple juice, soy sauce, rice wine vinegar, fish sauce, and chicken broth. Set aside. Turn on the Sauté setting and when it it hot, add the oil. Then add the onion and bay leaf and sauté until soft. Add the red bell pepper and jalapeño, and sauté until the red bell pepper is softened, but still a little firm. Then remove the mixture from the pot into a bowl and set aside. Add another Tbsp of oil to the pot and add the garlic and ginger. Stir and cook a few seconds, then add the pork chunks, pineapple chunks, and red pepper flakes. Cook, stirring occasionally, until the pork is slightly cooked on all sides. Scrape the bottom of the pot to loosen up any browned bits. Pour the sauce over the pork, sprinkle salt and the brown sugar over, and close the lid. Turn the steam release knob to the Sealing position. Turn off the Sauté function, then press the Pressure Cook/Manual button, or dial. Then use the +/- buttons or dial to select 10 minutes. The pot will take a few minutes to come to pressure. While the pork is cooking, mix 2 Tbsp cornstarch with 1/4 cup of reserved pineapple juice to make a slurry. Set aside. When the cooking cycle is finished, let the pot sit undisturbed for 10 minutes (10 minute natural release). Then turn the steam release knob to the Venting position and manually release the remaining steam/pressure. When the pin in the lid drops down, open it and use a slotted spoon to remove the pork to a bowl. Turn the sauté setting back on. When the sauce starts to simmer, stir in the cornstarch slurry and cook for a couple of minutes until sauce is thickened. Then turn off the pot and add the pork, and the red bell pepper/onion mixture in and stir to combine.